What is a slow bowl feeder? Do you have a dog that inhales their food? Puppies in particular are notorious for this, and they often end up vomiting right after! Other breeds, such as hounds, also eat incredibly fast and often look bloated. So, what can we do to help this issue? The answer is to use a slow feeding bowl. A slow feeding bowl is a dinner dish that has a maze-like design. When you put food in this, it forces your pet to slowly eat because the design doesn’t allow them to inhale everything. 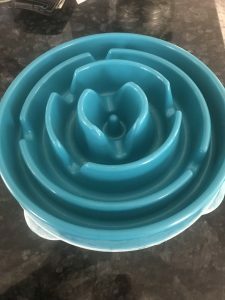 The food sinks down in between the obstruction in the bowl (pictured in article) and your dog has to work harder and smarter for their meal. It is a simple way to help slow an overlooked issue for many dogs. Why is it potentially important to slow down your dog’s eating habits? All of these are issues that can be stressful for both the dog and the owner. However, bloat is a very serious medical condition that can be life threatening. A slow feeding bowl is a very effective way to help prevent some of these problems. In addition, eating slower may help better absorb food – just like with humans. Many local pet stores will carry them. However, if your local stores don’t carry them you can always visit www.chewy.com and see what they carry. They are very affordable and are easy to use. To sum things up, eating too fast can create a number of issues for our dogs. The biggest problem is the potential for food bloat. However, a slow feeding bowl is a very cost effective way to help. Want to learn more about slow feeding bowls, visit this link here! http://advancedanimalchiropractic.com/wp-content/uploads/2018/11/bowl-e1541530581758.jpeg 4032 3024 Dr. Christina Cole http://advancedanimalchiropractic.com/wp-content/uploads/2019/02/logo-l2.png Dr. Christina Cole2018-11-06 19:01:352018-11-06 19:02:37What is a slow bowl feeder?